As we approach the 24th of November, Thanksgiving shopping and preparations have begun to plateau with last minute pickups as folks begin to shift their focus to Black Friday sales and shopping strategy. With a number of local businesses opening their doors to purge this years’ stock for pending Christmas inventory, this is a great opportunity to support community business endeavors without breaking the bank and traveling far and wide for holiday goods and services. 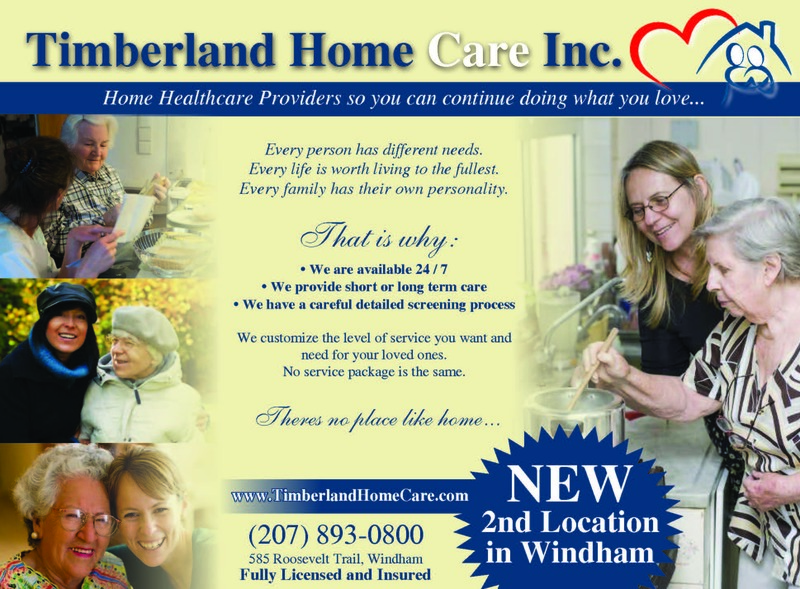 In Windham, Mills & Company will be opening at 9 a.m. on Friday, with sales on home goods, from comforters to knives, lasting until they close at six. Reny’s, a must-stop Maine shopping experience, is open from 8 a.m. to 8 p.m.; with a 20 percent off sale on all toys, winter boots and Christmas inventory lasting from 8 a.m. to 10 a.m. Friday morning. Blossoms of Windham provides for not only full-service floral needs, but just recently introduced their Christmas stock and encourages folks to come in anytime from 9 a.m. to 5 p.m. for a look-see. For those out and about on their own on Black Friday, a variety of deals are being offered by Heaven & Earth Day Spa and Wellness Center: Including a 75-minute massage and moisturizer for $99, a spa pedicure and hand massage for $35, and a spa manicure with a foot soak at $55– anytime from 8:30 a.m. to 8:30 p.m! It can get tiring and stressful when you’re out shopping for holiday gifts, so why not break to treat yourself while you’re already out? If you prefer to stay in avoiding the consumer chaos, drop into The Craft Shop between 9:30 a.m. and 5 p.m. for a wide range of creative activities any time before Thanksgiving or during Black Friday– they always have something going on! If you’re out and about with the family, Smitty’s Cinema is a great dinner-theater experience likely to please anyone. Beginning at 12:01 a.m. on Black Friday, the cinema will be offering an online-only gift card sale lasting until Monday, the 28th, at 11:59 p.m. More details will be released on its Facebook and webpage on Thanksgiving at 4 p.m. Don’t miss out! If you find yourself stumped on a gift idea, or wanna prepare for any last minute surprises, think: Who doesn’t like dinner and a show? In Raymond, Cricket’s Corner toy shop is offering sales from 10 a.m. to 5 p.m, which is bound to have something satisfactory for any youngsters in your life. And if you find yourself hungry in that area, Cafe’ Sebago is open from 6:30 a.m. to their regular closing time and is awaiting details on delicious daily specials for the Black Friday crowds. The Aging Crow, a family-owned country-style and primitive decor business, will open from 10 a.m. until 4 p.m, offering a number of locally made home furniture and accent pieces. Essentials Gift Shop will offer diverse inventory, from toys and skin care products to home decor and Stephanie Dawn purses, from 10:30 a.m. to 4:30 p.m. Check out the bags made from recycled sails and the Sea Rope Maine bracelets. Mexicali Blues is offering a 10 a.m. to 6 p.m. sale of 25 percent off everything in the store– with goods ranging from apparel and jewelry to bags and home decor. With a variety of goods typically available at a low cost, Family Dollar will be running two ads this week– one Monday and one Wednesday– outlining deals for their 8 a.m. to 10 p.m. hours on Black Friday. While there are plenty of retailers, storefronts, and businesses to choose from on Black Friday, local businesses such as these– and many others– depend on every little transaction; each one sustaining the dreams of their owners and furthering the development of small businesses and their employees that strengthen our communities and our economy. Local businesses benefit our communities with job offerings, economic security, and through their unique products and services that differentiate them from other in the marketplace. Their efforts, their sacrifices, and the fruit of it all stimulates a holistic sense of value, from your shopping experience to the products you bring home. Every dollar spent/earned, every interaction, counts towards fulfilling a dream, and it can all happen right close to home. Bakery, with its sweet and savory delights for locals and commuters. Bruce Wiley worked in a donut shop as a teenager and never forgot the personal experience of serving donuts with a side of hot coffee. “It was in the back of my mind all these years. It’s time to make the donuts,” he said. The shop opened in 2013 and became an almost overnight hit. He spent his off time searching for equipment. “I didn’t have to buy it (right then) so I got good deals,” he said. With some thought on traffic patterns and locations, he settled on the perfect spot, 1246 Roosevelt Trail in Raymond. He and his family took five months to get the space ready. As a construction worker for 30 years, Bruce worked outside in the cold and dirt. He knew how important it was for the community to have a place to pick up a hot coffee and a baked good. The business is very family-oriented with Bruce’s mother, Carolyn, and father, Dean, spending a lot of time working. Carolyn bakes on Mondays and Tuesdays, often different selections from the rest of the week. Village Donut is very community focused and donates to local churches and schools. “The community has been so good to us,” Bruce said. He works with summer camps, hospitals, Saint Joseph’s College and other businesses. New hours have begun for the shop, with increased winter hours to cater to the locals. With the longer hours, Village Donut will now offer soups, stews, chowders and lunch specials like chili, pigs in a blanket, sloppy joes and chicken pot pies, single and family servings. They will be baking bread and having that available as well. Crunched for time? Someone could stop in, pick up a meal, bread and a dessert and not have to worry about cooking that night. The donuts draw people in, but the scones and muffins, coffee cakes and whoopie pies keep them coming back, Bruce said. Village Donut doesn’t keep around day old donuts, choosing to donate them to senior home and senior meals in the area. “We try to make use of them. We’re too Yankee to throw things away,” said Carolyn. 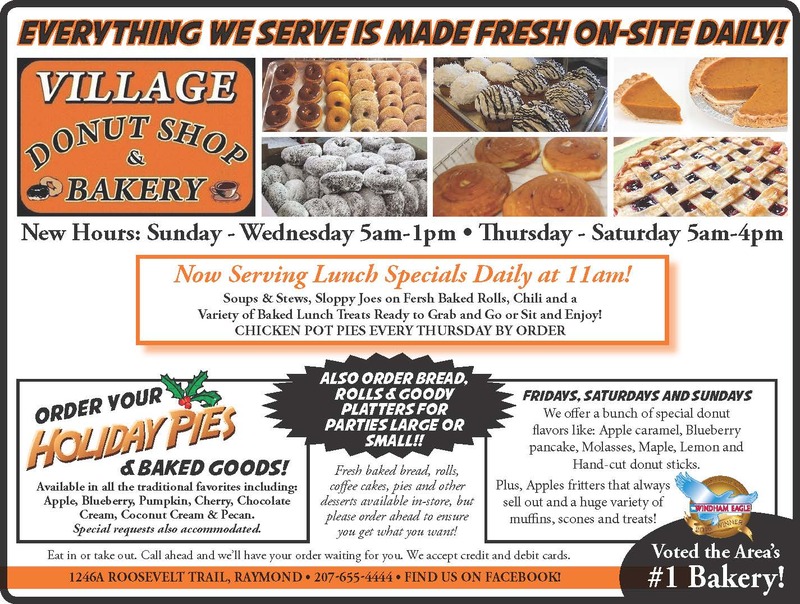 This fall the Village Donut is taking pie and platter orders for holiday meals or parties. Large or small, they take special requests with 24 hour notice. They also do cakes, but nothing fancy, Bruce said. On Thanksgiving stop by to experience all the Village Donut Shop and Bakery has to off or visit them for their annual tradition of free coffee and donut in the morning. They will have bread and rolls available first come, first serve. To guarantee they have what is needed for dinner, call ahead. Many times when regulars are going to be late to the shop, they call to ask to have something set aside for them, said Carolyn. Soon Bridgton will know the delights of Village Donut Shop and Bakery when Bruce opens a shop there. Bruce wanted to throw out a thank you to Chris for helping the shop get started in Raymond. Village Donut is on Facebook or to place an order, call 655-4444.
they would never have time to meet and give advice one on one - and – they don’t have the necessary licenses to provide the right services for the advice they hand out. When it comes to financial decisions, look local. Find a company, like Investment Executives and Craig Dickson, who works with individuals and families to help them meet and exceed their financial goals. Craig Dickson works with individuals and families to create a smart, easy to follow, easy to do, money plan. From insurance and financial services to real estate and social security maximization, Dickson can help find missing money or help steer a client to take notice of options available to them. He can help people with rolling over a 401K plan or even sell a home through The Maine Real Estate Network, where he is an agent. Investment Executives is based in Biddeford, but has a satellite office in Windham, on Route 35 next to Gilbert’s Chowder House. Dickson’s goal is to have four offices in key locations to best serve Western Maine foothills and Southern Maine. With 15 years of experience, Dickson can help frugal blue collar families or business executives reach their financial goals. “I have earned the credentials to offer several financial services products in Maine,” he said. “It’s easy to plan with a lot of money. I work with local people where frugal is the Maine mentality. I appreciate that, I grew up in a mill town. Both grandfathers, my dad, and my brother all worked or continue to work in the mill,” Dickson said. Dickson is able to help clients with bill reduction. “We’re getting nickled and dimed to death,” he said. “I want to help Mainers create a life time of income they don’t have to worry about running out of - while concentrating on family life.” He also acts as a broker looking for the best deals on life and long term care insurance. Dickson is also the creator of “The Maine Money Academy,” which teaches students through on-site training from a plethora of classes like Tax-Free Retirement, The Personal Pension Plan and Life Insurance. The motto of the program is “More – Intelligent – Money”. The trainings take place at Central Maine Community College and Southern Maine Community College in Brunswick. Classes are also available, at work sites, upon request. Dickson is also a real estate agent who works for buyers and sellers. He started in real estate mostly to help his clients sell properties from estates. He will list properties, but will refer those who have more needs when it comes to buying and selling. Through Investment Executives, people can also connect with Enrolled Agents for filing their taxes. EA’s can provide the same filing services as a CPA, and often times are more affordable. The EAs are perfect for individuals who might need help with tax preparation including college deductions or small businesses who need to fill out Schedule Cs. The EAs are federally licensed tax practitioners that not only help with filing, but are also empowered by the US Department of the Treasury to represent taxpayers for audits. “We want to be a one stop shop,” he said. Investment Executives is known as “The Complete Advisor” and “The “Green” Advisor” who can help people “reduce, reuse and retire.” That’s reduce debt and monthly bills, reuse by using the savings in a different, more profitable way, and retire on time, early or with enough money for life. “This is the green that matters to hard working Mainers,” he said. It’s never too early, or too late, to start putting away some money from the first job or the fifth. The impact of time can not be understated. Even if it’s $50 per month or a minimum of 10 percent, they will see a difference, said Dickson. When the economy is in turmoil and heading in the wrong direction, some people take the money and run, instead of taking the opportunity to grow the money. Dickson can help clients make informed decisions about their money. “The hard part is getting started. They don’t miss it when they make little adjustments in their monthly budgets,” Dickson said. For more information on The Investment Executives or The Maine Money Academy, visit www.TheInvestmentExecutives.com or www.TheMaineMoneyAcademy.com. Dickson can also be emailed at cdickson@theinvestmentexecutives.com or by phone at 1-855-625-3736 (toll free) or 207-807-2738. They can also be found on Facebook, Twitter and LinkedIn.